And it's called the anti-recipe because first of all, if you've ever seen me in the kitchen then you know that I'm the last person who's qualified to be dishing out advice on adding a teaspoon of vanilla like so. Did you hear that? That was Tyson in the background yelling, Amen! And second, because these things are like 4 ingredients. Which doesn't qualify them for fancy titles like "recipe". So let's get on with it shall we? Mix the butter, egg and devils food cake together till you get a dry dough. Then shape the dough around the Rolo until you have a little ball. Stick em on an un-greased cookie sheet and put them in the oven for 7-9 minutes depending on your gooey preferences. Then eat them for breakfast, lunch, dinner and your mid-morning snack. Also, dream about them, take them on walks and give them pet names. excuse me while I die. looks crazy delicious! I am seriously regretting giving up sugar for lent...ha! Oh my tastebuds! I must make these for brunch this weekend! definitely going to make these - thanks for the recipe! You're so funny Sydney! These look AMAZING! I am so hungry right now that a jar of tums sounds appetizing. And this post is not helping. Delicious!! Anti-recipe haha I love it. I feel like most things I make, dinners included, are anti-recipes...that is they are under 4 ingredients. 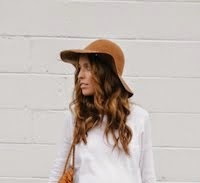 Love your blog btw :) I grew up in DC but live in Utah now with my husband and little girl so whenever I see pics of your blog from home I get so homesick! I hope you are enjoying the area! Oh god, these look so good and now you have me craving them. YUM, I need to make these! Um... yeah. These look amazing. I am probably going to make them tonight. Thanks for sharing! My tastebuds are madly thanking you! (the scale isn't!) Rolos and devils food cake. I do believe I'm in heaven! I never thought I'd see the day when you'd post a recipe, however simple it may be. Bravo, Sydney. Bravo. Standing ovation over here. you make me laugh, but I'm in love with rolos, so this must be a holy matrimony of sorts. thanks! I've recently become obsessed with cakebox cookies. They're so easy and always seem to turn out! Hahahaa pet names. That made me laugh out loud. These ARE delish. I need me some of those! you should start a cooking blog! ;) don't worry, I can't cook either. Wow!! These look perf!! Looks like someone is becoming quite domesticated haha!! Will totally have to try these, and soon!! These sounds delish!!!!! I am a big cookie baker and have to make homemade cookies atleast once a week or I am not happy, baking is my fave, and my neighbor's really love that too! I will give these babies a try here soon, thanks for sharing! Yes, these are one of my favorite cookies!! Haha! Yum!! And in case anyone does NOT know (like ahem*ME*ahem) you can't substitute margarine for butter or the dough will stick to you worse than saran wrap. Yum. Thanks Sydney! I love a good non-recipe recipe. Okay! Keep posting "recipes"! 4 ingredients?? Anyone can do it! yum! i'm planning on making these tonight and bringing them to work tomorrow. as much as i love making friends with my desserts, having them around for longer than an hour can get dangerous at my house. You fooled me with your domestic abilities. Those look amazing!! Seriously this is not even right!! Can't wait to try them!! yuuum! definitely gonna give this a go! These look easy enough for even me to attempt! Thanks for sharing!! Love easy recipes, thanks for sharing. these are seriously addicting!! now i'm gonna have to go make me some.. cookies for the breakfast start the day off right. Posting this might have been a bad idea, I might just have to make those so that I can eat all of them myself. Oh the joys of learning to cook as a wifey...I'm right there with you sister! Going to HAVE to make these! I have made those! And they did not last long! So easy, think of all the other combinations! oh my YUM!!! these look absolutely delicious! and so soft and gooey! my kind of treat! YUM thank you for this recipe! Thanks for my next month's PMS indulgence!!! haha love it! Im no good in the kitchen and super relieved my husband does all the baking and cooking! mmm they look so yummy! ooooh i can't wait to make these! If it has a stick of butter, then YES. Okay a) I think I gained 5 lbs just looking at the pictures and b) I am totally sending this recipe along to my daughter who is the baker in our little family-- how yummilicious!! Oh, I'm a big fan of anti-recipes, I'm the short cut extraordinaire when it comes to my own "recipes", so naturally, I love this! Uh making them this week? Yes! Please tell us about the dress you're wearing! your too funny, those look delicious. What are you wearing? beautiful pattern! Haha Yum! Why yes, I will make these bad boys and take them on walks and give them pet names. ;) Love your posts! Boom Baby! I am so doing this.... like this weekend!!! My homeade cookies are always a little too hard for me. I want to see them brown on top and apparently that means they've kind of over-cooked! So this is fool proof, right?? They're already dark so no need to check for brown tops! This sound so good! Thank you for sharing! Can't wait to try it out for myself. 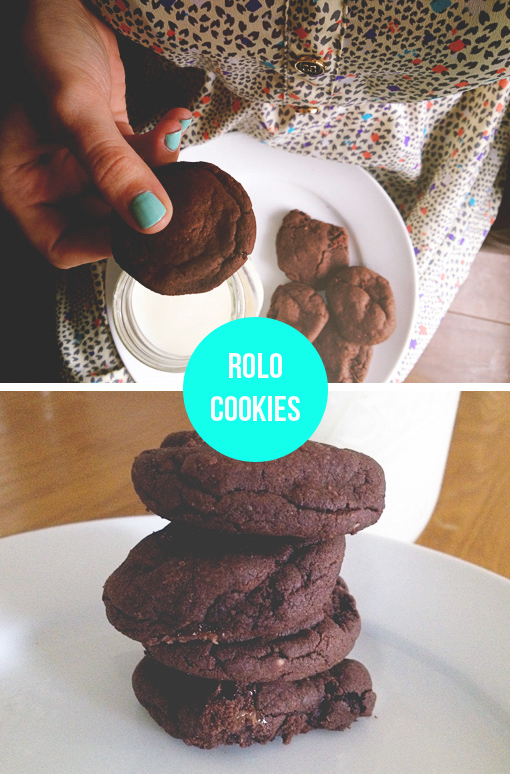 You had me at Rolos...the only four ingredients is just a perk! Thanks for sharing! So easy and delicious! I'll probably have to make these sometime! Yum, these look absolutely delicious. I'm so going to make these sometime soon. I need to make this!! Looks so easy and delish!! Have MERCY! Can't wait to try these!!!!! THANKS! This is my type of recipe--and yes it is a recipe becaus eif you are mixing stuff that definitely counts as a recipe right?! These look to die for, can't wait to make them. Thank you! ummmmm can't wait to make these. Had ot let you know that I made some of these yummies last night, well sorta close, I had everything on hand except for the devil's food cake so I used German chocolate cake instead, and they were so so good! My little girl's loves them too! Uhhh these look fabulous. Yes. Love Rolos!!! I must must must try this! Mmmm! Those look so yummy! Thanks! I thought my family was the only one who made cookies out of cake mix in a box! However our recipe is extra ridiculous with 2 boxes and tons of chocolate chips. It makes enough to serve the small army that most families have around christmas time. I understand the unrelenting urge to keep coming back for more! I suggest freezing them and then eating them slightly frozen but still chewy and delicious.